Wall to wall color, everything you need for vegetable gardening and much more! In the dead of winter, we all dream of spring. We wish for it, we yearn for its warmth; indeed, we lustfor it! Perhaps lust is a bit strong for you, but for many, it is not. Passion, which is normally kept within the confines of locked doors, is frequently on display this time of year. It is very earthy, the sounds of which are unmistakable. The carefully suppressed ‘oohs and ahs’ are purposefully kept at a low volume, not wishing to call attention to their normally demure demeanor. Make no mistake; there is an animal in there wanting to scream out in gardening ecstasy. Wait a minute! This is supposed to be a gardening newsletter, not some tawdry tale of tangled tillage. I can explain. In preparation for delivering this week’s epistle, I got caught up in the midst of the hot peppers. My weakness. My dilemma. Is it all a dream? My pulse quickens. I have intense Scoville sensations of peppers past; just reading the words, ‘Carolina Reaper’, ‘Trinidad Scorpion’, ‘Ghost’ (Bhut Jalokia), or ‘Thai Dragon’, brings tears of joy…and pain to my cranial unit. It is not a dream, it is what I live to grow and consume: Extremely Hot Peppers. Even though you may not share my passion regarding these denizens of the garden, we have over twenty other less ‘hot’ varieties along with over twenty other ‘sweet’ varieties of peppers. 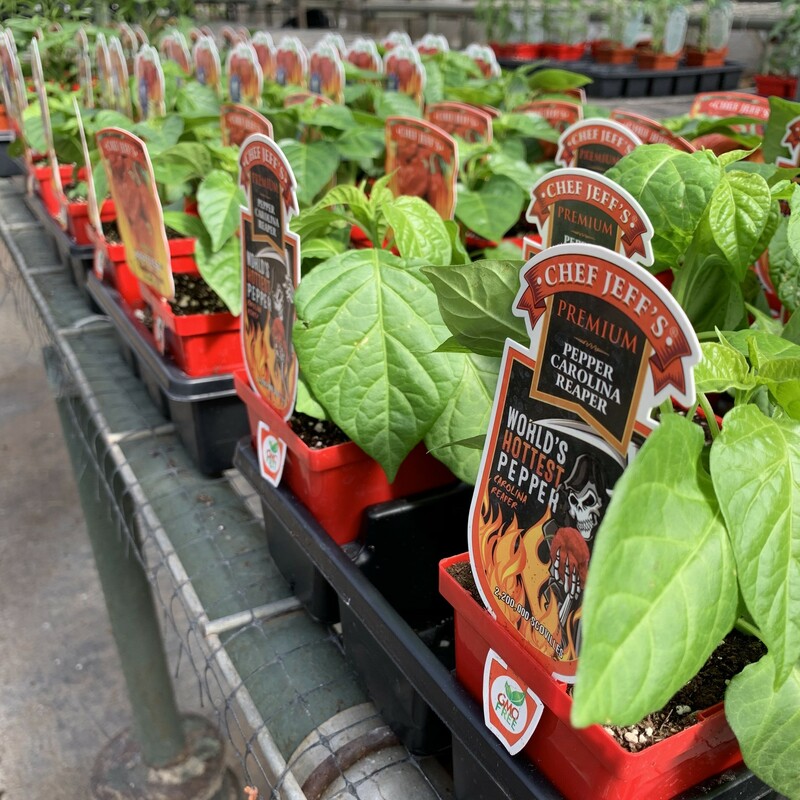 It may be that peppers are not what strikes your fancy, fear not, we have over 60 varieties of tomatoes; an extensive selection of heirlooms along with many VFN hybrids. We also have over 60 varieties of herbs. Every balcony, deck and patio should have a few containers of your favorites; they are easy to grow when you use EarthMix® Proganix™ - O for containers, or EarthMix® Garden™ for raised beds or in the ground. EarthMix® products are 100% organically and sustainably produced. Bring along photos of your project area; we’re here to help!